Built in 1879, Camp Galashiels has been in the same family since 1905. The cedar-shake covered cottage includes a wrap-around living room and dining room, bathroom, galley kitchen with modern appliances, and one bedroom on the first floor, with two more bedrooms on the second floor. A covered veranda surrounds the cottage on three sides. The back deck offers a protected view of the spruce woods.The cottage overlooks Walker's Beach, with a private path to the beach. A private dock with deep water anchorage invites swimming, fishing, and boating. Public boat ramps are located nearby, and kayaks can be rented in Friendship village. A tennis court is available right on Martin Point. A full spectrum of summertime activities is available within a 45 minute drive from Boothbay to Camden, but here you can enjoy the real Maine in a secluded fishing village - lobster available right from the docks! Relax; enjoy sea and shore activities right at your doorstep in rustic elegance and seclusion! We inherited this property from Betsy's parents - we are the 4th generation to be blessed with being the caretakers of this special place! It was purchased by Betsy's great-grandfather in 1905. We appreciate and enjoy being able to share our cottage with others. There is no place quite like mid-coast Maine. The ocean, beaches, islands, people - all combine to make Friendship a special place! Because it is a working fishing village, it retains the real Maine value and peaceful atmosphere while being close enough to the tourist towns of Camden and Boothbay Harbor for entertainment. The deep water dock, private path to the beach, and big wooden swing on the porch with its sweeping view of Muscongus Bay all combine to provide each vacationer with variety and comfort for the perfect Maine stay. Come see for yourself! The shower is in a separate room from the bathroom. The cottage comes equipped with bed and bath linens, dishes, silverware, and pots and pans. Kitchen staples, paper products, and trash and cleaning supplies are also provided. A wide variety of games and videos exists for rainy day fun. 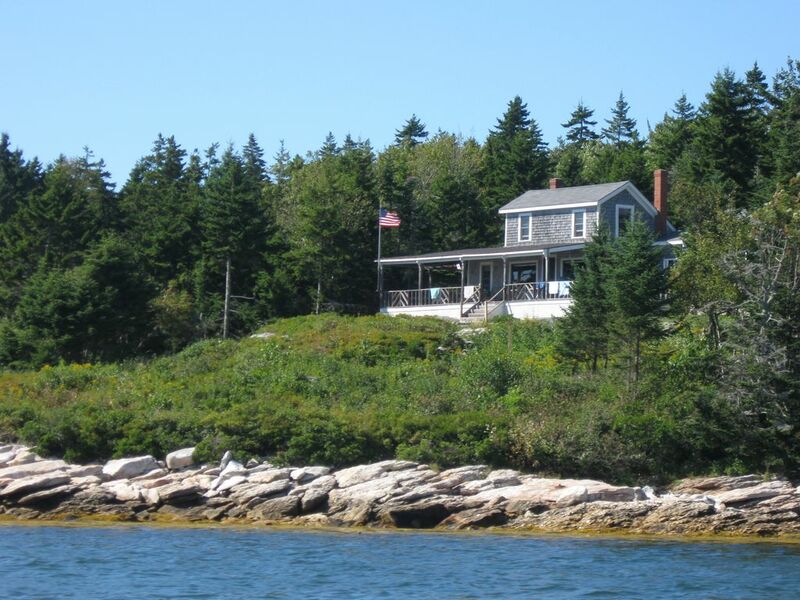 The most idyllic Maine oceanfront cottage! Heaven! There are far too many words to describe this beautiful seaside cottage. All the other reviewers have successfully described the cottage and location quite accurately. We'll attempt to come close to how much we've enjoyed our week here, and hopefully we'll be back soon!! A The awesome, ever changing view has anchored us to the porch! We can't seem to get enough of it all....it never gets old! us that fog & mist are a given in Maine! heading out at 3:30 am!) AND we enjoyed eating lobsters at Miller's! Luscious & lip smacking good! everlasting memories.....still more to come! feeling throughout the long winter ahead! S Sincere ~ we're fully satisfied for having a SENSATIONAL vacation! Thank you Betsy & Steve White! Thank you, Monk family - we enjoyed having you here and look forward to your return! We're glad you found everything to your satisfaction - that's always our goal for our guests. And we loved your poetic note! This was the perfect place for our busy family to wind down and finally relax. The region provides plenty of pretty towns to visit if you like, but the cottage is a wonderful world unto itself. You are staying in a 150 year old piece of Maine history. The beach and tide pool life next to the house provided all the entertainment we needed. The owners are helpful but not intrusive, you can rent kayaks from Bob at the Outsiders Inn. A treasure. Thanks for telling others about your stay with us. We're happy that you enjoyed Camp Galashiels, and hope that you will return another time! This was the most relaxing vacation I’ve had for as long as I can remember. The moment you step onto Camp Galashiels’ wraparound porch and see the ocean, all the troubles melt away and your vacation has truly begun. Located well away from the hustle and bustle, this place is not for excitement-seekers, but rather those who want a simple, no-fuss family vacation. The generations-old structure, lovingly maintained and preserved, is rustic, warm and cozy, yet surprisingly breezy and open, a perfect mix of refuge and lookout. Full of little treasures and wonders (like a corner porch swing facing the sea and a vintage copy of a Will Rogers diatribe against prohibition which had my husband laughing out loud), Camp Galashiels welcomed us with a fully-stocked games corner, comfy couch and window seats overlooking the ocean, plenty of extra bedding and all the intriguing nooks and crannies you would expect from a great old house. This is a place where generations of families have made happy memories, a place with a soul. Though secluded, there are ample opportunities to stay connected, whether by meeting friendly locals during your explorations or by chatting with whoever happens to be enjoying the small beach below. Though there are never more than a few people there at any time, my young daughter had no difficulty making a new friend each day or finding a new niche to explore. The kitchen is very well equipped with every cooking utensil known to man (three different cast iron pans, mixing bowls galore, innumerable lobster shears…), including a good selection of pantry basics as well as plastic wrap, aluminum foil and parchment paper. You literally need only to bring your own food. I found an antique mezzaluna, pointy forks (a high prize in my family), and an instrument of indeterminate use that turned out to be a vintage egg slicer. Everything here is in good condition, albeit used. Hosts Betsy and Steve are gracious and friendly, yet discreet. Betsy didn’t insist when we showed only modest enthusiasm for lobster (though we could tell she was a bit disappointed). We capitulated, however, and bowed to local Maine tradition on our last evening, going down to the docks to buy 4 big lobsters right off the fishing boat. I have to say, this is one of the best vacation memories we are likely to ever have. Thank you, Betsy and Steve, for sharing your lovely summer home with us. This was just what the doctor ordered. Thank you, Greg and Violette - we're always glad when our guests have a wonderful time. I loved finding the special rocks decorating the front of the cottage - we've left them there for others to enjoy. We're looking forward to your next visit! I have visited this little slice of heaven three times now and will be back, again, at the earliest opportunity. The Whites are gracious, warm, and always willing to go the extra mile for the comfort and pleasure of their guests. The minute you step into the cottage, you feel at home. Of the myriad activities available, my favorite is a total absence of activity.....this is a book lovers paradise. Make one of the rockers on the porch your own and read away. The sound of the waves and the breeze, the sun on your face.....well, maybe a just a little snooze before reading! This is a wonderful area for long walks as the scenery is some of the most beautiful on the planet. Cooking locally grown fresh veggies in the perfectly stocked kitchen or heading into Waldoboro for home cooking at Moody's are my favorite dining options. I can't possibly say enough good things about the Camp Galashiels experience; you just need to try it for yourself! We are always happy when guests write a review other than in our guestbook, especially when they have nice things to say! We are happy when folks feel at home here. Camp Galashiels is equally wonderful as a base for exploring the midcoast area, or as a vacation spot on its own, or both! We try to make each visit a memorable one, and are always glad to welcome new guests and returnees! Camp Galashiels not only lives up to, but exceeds expectations. The large porch overlooking Muscongus Bay is the perfect vantage point for late afternoon relaxing & watching the moon in the evening. We never tire of watching the lobstermen ply their trade within an arm's reach of the shoreline. The wildlife is incredible too! We saw seals & puffins very nearby. The cottage itself is a delightful space with many references to the area and it's offerings as well a a good dose of insight to the history of the area. Betsy and Steve White are incredible hosts attentive to your every need. And I don't want to get started on the lobster.... So many fresh lobster, so little time! I can hardly wait until I return. And when I do, Camp Galashiels will be my destination. We are always pleased when our guests enjoy their time with us! We look forward to returning guests each year, along with first-timers. We appreciate their taking the time to write a review, also, about our very special spot. Highly recommend staying at this cottage. This is a very special place where expectations I didn't even know I had for a cottage experience were met and surpassed. Surprise after lovely surprise unfolding around each corner or just cooking a meal with the ocean in view. It is ALL here. Natural coastal beauty: ocean, rocks, surf sounds, curvey and woodsy foot paths which lead all around, broad grassy lawns just where they should be and some of them framed by pretty flower beds and all set among bird calls and chirps, peace and joy. You can sit and swing to and fro on the broad veranda looking out over the ocean in an oversized wooden swinging chair which has sides and a back and will seat more than one person. You can walk on the beach and look for sea glass. You can watch the life of the ocean; boats, birds, bouys, seals and the ever changing face of the weather and set your own pace. You can read, commune, day dream, conjure your hopes and reclaim your dreams. Close to everything but private and away from it all. This is an authentic cottage experience and magical. Comfortable, clean, well stocked, it is large and roomy and effortlessly will absorb the guests and still there is room for these cozy and wonderfully interesting nooks everywhere to curl up in and sleep, read, watch the gulls swooping and fishing or watch and listen to the waves shushing on the rocks. The owners are hospitable and wonderful and add to the overall sense of welcoming. I am going back as soon as I can. The many towns within a 45-minute radius of Friendship offer art, historical, and marine museums, golf, sail and motor excursions, island ferries, fine dining, hiking, aquarium, shopping, festivals,and lighthouses. Information on all this is available at the cottage. Beach combing, boating, swimming, tennis, birdwatching, fishing and hiking are available on Martin Point.